I saw this dish in a recent issue of Taste of Home magazine and knew I had to make it. 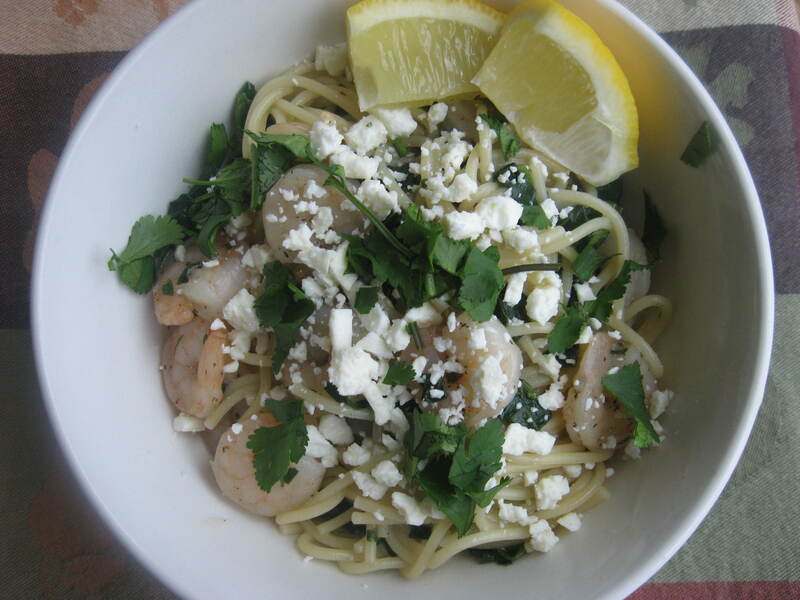 Feta, shrimp, lemon and pasta? Yup, I can fall in love with that combination. Being Catholic, and it being Lent, I look for new and different meatless recipes to serve for the next few weeks. This one was on the top of my list. Of course, after I made it and was cleaning up I realized this recipe calls for chicken broth, and, yes, chicken broth would be considered a meat when cooking that should not be used on a meatless day during Lent. I’m sure God forgave me for that minor mistake. I hope. I only made one change to this recipe, and that change came about because I couldn’t get one major ingredient. Fresh basil. I see it all the time in any of our grocery stores, even during the winter, but for whatever reason, fresh basil decided to evacuate itself from all produce sections in my area last week. I did, however, have two bunches of fresh cilantro in my fridge. In fact, I always have fresh cilantro in a mason jar in my fridge because I can’t live without the stuff. I was hesitant at first to make the switch from the basil to the cilantro, but after reviewing the ingredients again I realized cilantro would work just as well, if not better. I do plan on making this again using basil, but if you find yourself in a pinch like me, I highly recommend the substitution of cilantro if need be. That was the only thing I changed about this recipe. Cook pasta according to package directions. Meanwhile, in a large skillet, sauté shrimp in oil until shrimp turn pink. Add the garlic, salt and pepper; cook 1 minute longer. Remove and set aside. In the same skillet, heat 1 cup broth, lemon juice and dried basil. In a small bowl, combine cornstarch and remaining broth until smooth; stir into the pan. Bring to a boil; cook and stir for 2 minutes or until thickened. Stir in spinach and shrimp; cook until spinach is wilted. Drain pasta; serve with shrimp mixture. Sprinkle with feta cheese and fresh basil. 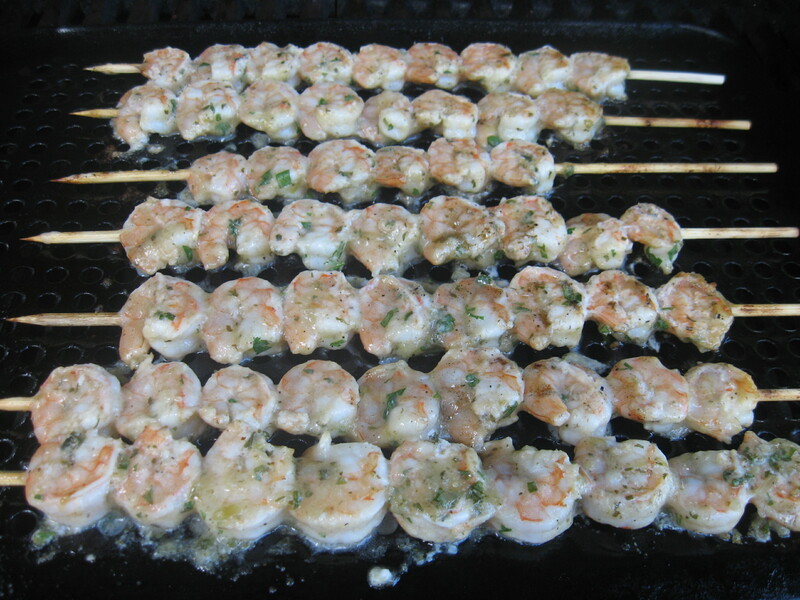 We grilled these little shrimpies up the other night, and they were gone in minutes. Truly. I cleaned them early in the day and then mixed up one of my most favorite marinades. You might remember seeing it here. 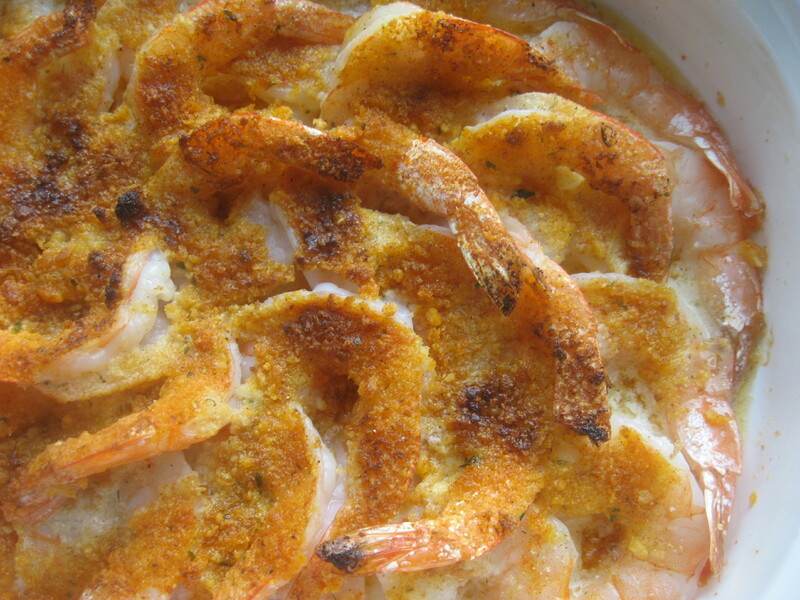 It’s become a favorite in our house and we’ve used it on chicken, pork, and now shrimp. I did change the measurements a bit from the recipe for the chicken when I used this marinade. I needed more marinade for the chicken than I did for the shrimp, so if you are doing the shrimp, follow the modified recipe here. If you want to make the chicken, follow this recipe. On the shrimp, this marinade was perfect. 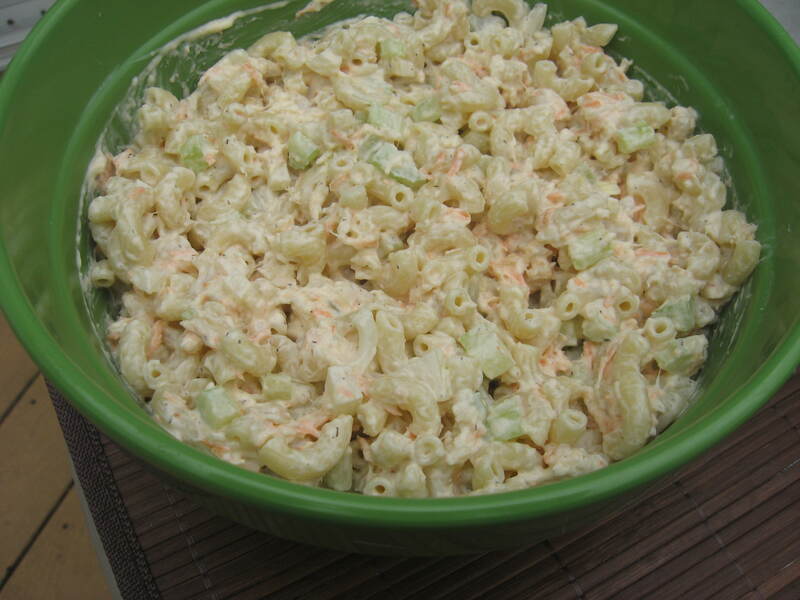 The shrimp really absorbed the flavors perfectly, and the marinade made for a creamy type of dressing for them. The shrimp I used this time were about a 50 count and they were just perfect. I grilled them using a grilling rack for seafood so they wouldn’t over cook. I prefer using the separate grilling rack when cooking any type of fish or shellfish on the grill since they tend to burn or dry out quicker if you put them directly on the grill itself. At least for me, anyway. I plan on doubling the recipe next time I make them, since my family plowed through these in record time and were still looking for more. Please try these. You will be very happy you did. Begin by cleaning and deveining shrimp. Place in a colander and rinse. Set to the side. In a separate bowl, mix together all the remaining ingredients until combined. Place clean and drained shrimp in a large Ziploc bag and pour the marinade over them. Place in the refrigerator and allow them to chill for 4 to 6 hours. If you are using wooden skewers, be sure to soak them in water before filling them with the shrimp so they don’t burn on the grill. Heat the grill to between 300 and 350 degrees. I grill these on a separate grilling rack I add to the top of the grill. I spray it with some cooking spray so the shrimp won’t burn. 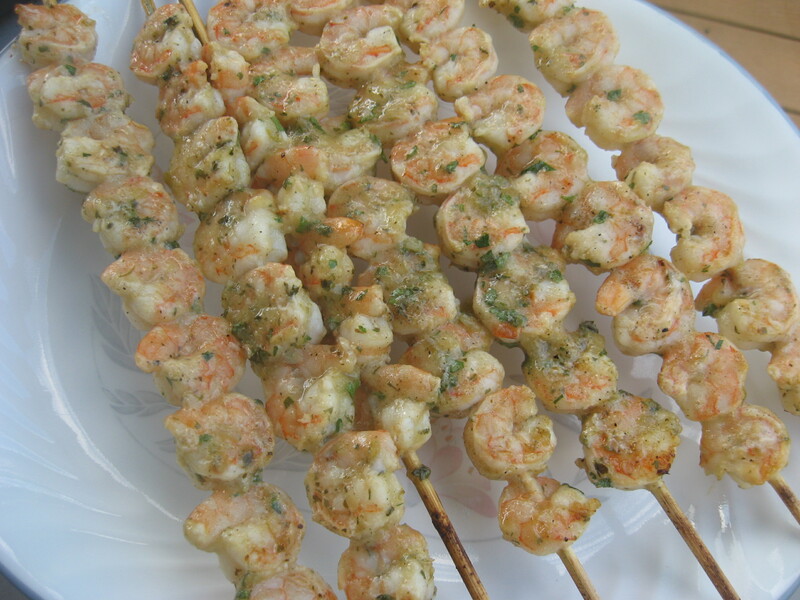 Begin by placing your shrimp on the skewers. You want to get about 8 to 10 shrimp on each skewer. Once done, place them on the grill rack, brush on some extra marinade and close grill. Allow to cook on one side for about 3 minutes. Flip them over and allow to cook on the other side. Mine went for about 7 minutes total. Just make sure you don’t over cook them or they become dry and rubbery. If you are planning to cook these directly on the grill and not using a cooking rack, they may take less time to cook so you will need to watch them. Once done, remove to a serving platter, serve them up with some lime wedges and enjoy. These would even be fantastic in a tortilla with some Pico de Gallo and avocado slices. That’s happening…soon. This past Christmas, my sister-in-law gave me a subscription to Cuisine at Home. I fell in love with this magazine immediately because it’s nothing but recipes, they are simple and very often fast, and they show detailed step-by-step photos for each and every recipe. The last issue had a ton of great recipes in it, and this is just one of them. I have to tell you that this is by far one of the fastest and simplest recipes I have made in a very long time. A perfect choice if you are short on time but want something delicious. I doubled the recipe since the original version was for two instead of the four I was going to be feeding that night. I also made the recipe in one large casserole dish vs. the two small individual dishes the recipe called for. Their presentation was more aesthetically appealing, but I was going for feeding a family and making something that tasted great. If you buy the shrimp that are already deveined and peeled you can save a ton of time as well. The official name of this recipe is shown below. But to me, it’s just Shrimp Scampi – Super Easy! 10-12 Extra Large Shrimp, peeled, tails left on and deveined, about 8 oz. Preheat broiler with oven rack 6-8 inches from the heating element. Melt butter in a saucepan over medium heat. Stir in lemon juice, garlic, dill, salt, and pepper. Let stand-off heat to steep. Combine bread crumbs, Parmesan, oregano and paprika in a small bowl; set aside. Coast 2 6 oz. casserole dishes with nonstick spray and place on a baking sheet. Arrange shrimp evenly in each dish. Divide butter mixture evenly between dishes and top with bread crumb mixture. 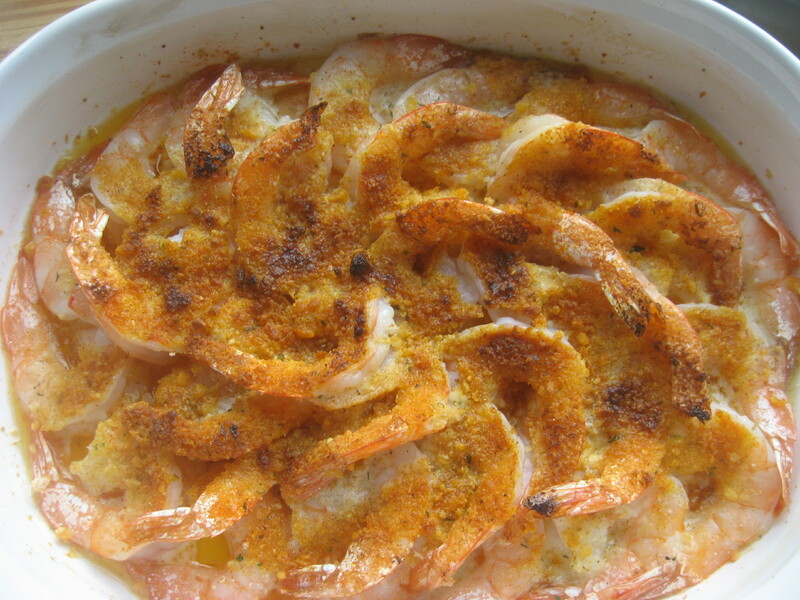 Broil until shrimp are cooked and bread crumbs are golden brown, about 5 to 7 minutes. Let cook 1 minute before serving. I served this with some rice, but next time I plan on doubling the butter sauce and serving it over some linguine instead. Some changes I made; I didn’t add the oregano because I’m not a big lover of oregano. It’s a little over powering for my taste. I also did not use fresh breadcrumbs. I used 1/2 seasoned breadcrumbs and half Panco and I plan to use that the next time I make it as well. It was a nice combination. This is definitely a keeper. Enjoy!